Did you know that you could be still be over the limit the morning after a festive night out? My delicious and simple Christmas mocktails will give designated drivers a more interesting choice of drinks. There are so many drinks parties, meals out and other celebrations at this time of year. If you’re driving, it may be tempting to have just one glass of wine or bottle of beer to celebrate with friends and loved ones. But even one drink could be enough to put you over the blood alcohol limit for driving. And even if you are not driving straight away, you could still be over the limit the next morning. Some people may drive after a drink because they don’t realise that they are over the limit, or because they think that a taxi would cost too much. If you’re the designated driver for your group of friends, then the non-alcoholic drink options can get a little repetitive. I usually end up opting for yet another Diet Coke, which doesn’t feel like much of a celebration. So for your Christmas party, try mixing up a couple of these mocktails to give the drivers a more exciting choice. For all of my Christmas mocktails, make sure that you chill the ingredients in advance and serve the drinks over plenty of ice. Each recipe makes one drink, just stir the ingredients together in a glass. Double up for a longer drink or mix a pitcher full for a party. And if your non-driving friends want to give the drinks an extra kick, they all taste great with a shot of chilled vodka mixed in! This is an alcohol-free nod to the Sea Breeze – it’s sharp, dry and really refreshing. You could swap the grapefruit juice for orange juice if you want to add a bit of extra sweetness, or top it up with soda water to make a longer drink. 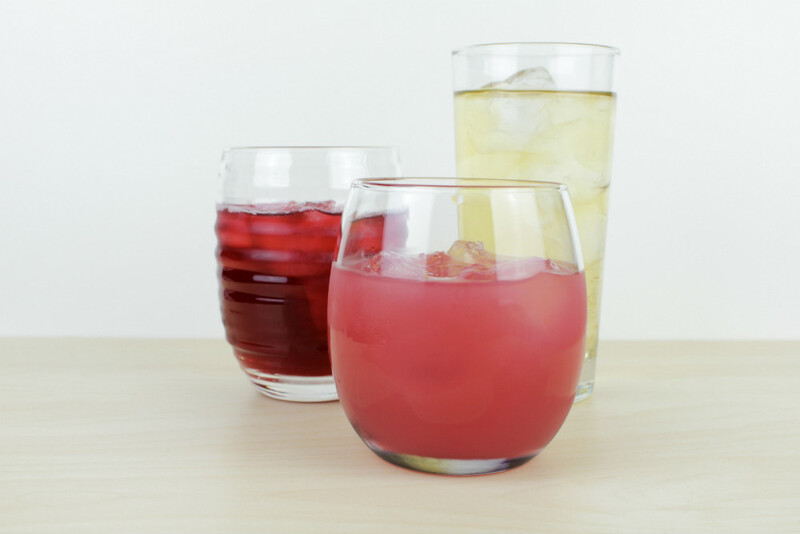 To mix a pitcher, just mix together one part of each of the fruit juices with plenty of ice. This is a sweeter mocktail, and the pomegranate juice gives it a really pretty colour. I use Ginger Ale, which you will find with the other mixers like tonic water and soda water. To mix a pitcher of this mocktail, you need to use 2 parts Pomegranate Juice to 1 part of Ginger Ale, and then add a good squeeze of lime juice. This is my favourite – I’d happily drink this any time of year. As above, I use Ginger Ale but if you wanted to give it more of a kick, you could use Ginger Beer (you’ll find that with the soft drinks). If you prefer to mix up a pitcher full, this drink is 1 part Lime Cordial to 3 parts of Ginger Ale with a good squeeze of lime juice. I hope you enjoy my Christmas Mocktails, and stay safe on the roads this Christmas! These sound delicious and I shall be trying them this Christmas. I do drink, but it’s nice to have some non-alcoholic options too. It’s always good to throw some alcohol-free options into the mix, isn’t it? I’m a big fan of mocktails and never touch the demon drink when driving. Great recipes, can’t wait to try them. What a great cause to be promoting, it’s too easily brushed under the carpet at this time of year. Sadly, I think Xmas is when a lot of drink driving tends to happen. They’re definitely more interesting than another glass of coke or lemonade! Great mocktails. I do love a great mocktail, it feels like I’m not missing out as I’m always the designated driver! I think if you’re having a party, it’s good to consider the people who are driving! I love the sound of the cool breeze – these are fab ideas, i may give them a try over Christmas. It’s shocking the amount of people who drink and drive. I hate being on the road over Christmas. Plus it’s not a bad idea to throw the odd non-alcoholic drink in, even if you aren’t the designated driver! I love fake cocktails. This looks very tasty.